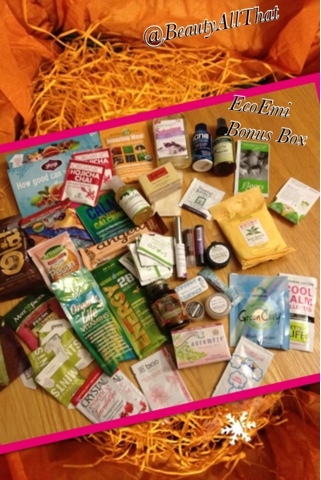 Beauty & All That: Eco-Emi bonus box! Eco-Emi is a monthly eco-friendly susbscription service that introduces you to a variety of beauty/bath/food products. I got this box last year and knew I had to get it again. Last year, I got the Large bonus box with all these products. They raised the price by $10 ($30 last year, vs $40 this year) but the amount I got last year was amazing. I'm hoping I get another super duper bonus box overflowing with eco-friendly goodness. Some products I received are: Yogi tea, Angell chocolate, Calm magnesium powder, Stevia, Burt's Bees towelettes, Crystal deodorant towelettes, Zen society facial cleanser, Green Clay mask, lotion samples, laundry detergent, hand sanitizer, and much, much more! 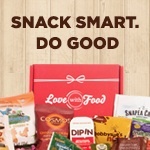 Get your Bonus Box today at www.ecoemi.com!